myblackfriendsays.com: Are all violent crimes hate crimes? It is possible for a white person to aggress against a black person and it not be classified as a hate crime. When asked why he aggressed, if the white person does not mention anything about the black person's race it is not immediately classified as a hate crime. 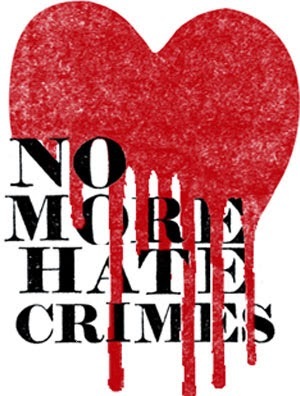 Only when the individual was motivated to aggress because of the color of a person's skin is it classified a hate crime. Your question about black on white or white on black crime is an interesting one. I would assume it would be black on white, based solely on the amount of media coverage these types of crime get. BUT, it may be because when a white person commits a crime agai st a black person, the race of the aggressor and victim is often omitted. Media skews perception once again. It might be that they handcuffed old dude in the front because his bones couldn't handle being put behind, or he had some sort of balance problem. Possible but not probable. His age might have also had something to do with it, at least giving them another reason to let him retain some dignity (and to disguise the real reason: that he is part of the police brotherhood). I do think that the law serves to deter hate crimes, though. Most law-abiding citizens tell themselves "I would do that if I knew I wouldn't go to jail for it.". Even when people like GZ get acquitted, most rational people say "He got lucky and I probably won't be as fortunate.". Just my two cents...not looking for a debate. anywhooooo - can a white transgress against a black and have it not be a hate crime. trayvon martin - race was not allowed as part of the prosecutors arsenal so yes, somehow they ruled that out as a motivator pre-trial. in a case that certainly it would have been reasonable to think it was a motivating factor. but yes, it has happened many times. black on white hate crime? it happens and is prosecuted as such. the numbers are low but the fbi stats will show roughly 10% (give or take) where the aggressor is black and victim white. i read about one in NOLA last year where the black attacker said "you're in the wrong neighborhood" . . . now, flip the races and tell rightwingers about that situation and they'll say "that's not necessarily race . . . " now why doesn't the media specifically say - black man charged with a hate crime?? well, i don't wanna get all conspiratorial but . ..
--- here's my question - can a black person be charged with a hate crime against another black person based on race? who kills who more? well, on the face of the fbi statistics -most races kill their own race more. however there is a slightly higher amount of whites killed by blacks. here are some things that make me wonder about that though---- 1. as it appears to me the fbi seems to be living by the one drop rule on that so - if a killer is half white and half black why does his black half get "credit" for that killing? 2. the fbi records are based on convictions and . . i think you can see where i'm going with this, right? cops - i'll repeat myself. the issue isn't how many are bad but how often they face any consequences for misaction - spoiler alert! i understand your point about hate crime legislation but i disagree. it's similar to my thoughts on why it matters that white people aren't "allowed" to say the nword. or why it's important to remove blue laws from the books. etc. it's important to collectively state -we all agree that targeting someone based on race is not acceptable. what can they do on the front end -- whooooosh! really? can't you just give us a quantum physics assignment instead??? i'd settle for "tell the truth" for now. but okay - the laws; recently it was brought to light that a retired judge had, over his career, sent thousands of racist, sexist, etc emails -- if this doesn't set them to review his career then at the very least it should set them to think about how they can prevent anyone like him from ever sitting on the bench again. we ask questions of jurors to try and reveal their biases .. . seems more important to do that with the judge, no? oh, and you talk about jails - how about a concerted effort to actually make them what they are supposed to be - a place of rehabilation.